$12,400 tuition, approx. $2000 for software and hardware, and a 2013 or later MacBook. International tuition is $17,400. The Digital Music Production Program is an intensive, one-year full-time certificate program designed for the modern independent music producer and composer to work in recordings, film, TV, gaming, advertising and multimedia. Electronic Music Production: Students will compose and construct original compositions and remixes with Ableton Live, Logic Pro, ProTools, and some of the leading 'soft synths' in the industry. Music Theory: Developing your craft as a music creator involves a dedicated effort to understanding how music is composed and structured. It is essential to speak the language of music in order to communicate with other musicians. Our theory courses are designed to provide a strong foundation for DJs, film, television, and game composers, music producers and songwriters. Recording and Studio Engineering: A core focus of the program, students will be introduced to the theory and practice of the professional recording arts. They will understand how music is recorded at a professional level, both in commercial studios and on their mobile setups. 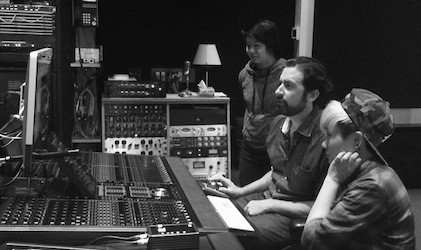 Students will learn ProTools with a certified ProTools Instructor. Mixing and Mastering Music: All modern music recordings have been mixed and mastered for mass distribution, and students will learn a detailed professisonal approach to the technical and artistic aspects of each. Composing for Film/Mixed Media/Advertising: Learning how to compose music for mixed media and trans-media projects can offer significant career opportunities in the industry. Music Business and Career Planning: This career-focused class offers students the core skills required to navigate the creative industries they will be working within upon graduation. Topics include legal aspects of the music business, marketing and promotion, distribution, understanding social media, and website creation. Beginning in September, classes run five nights a week (6:00-10:00 pm), Monday-Friday, for three 14-week terms, with a short break between each term. Each student will have their own mobile production setup on a Mac with a USB audio interface. Professional production software will include: Logic Pro, Ableton Live, Native Instruments Komplete, Miroslav Philharmonik, and Izotope Ozone. Students will also learn ProTools, the leading industry software used in recording studios worldwide, in a ProTools Mac lab on campus with a certified instructor. There is a 16 student maximum for each intake. As space is limited, acceptance into this program is based on an interview and demo submission process. Although no prior education or extensive experience in music production is necessary, a simple demo is an indication of interest in the couse of study. All of our instructors are qualified college-level educators and professionals currently working in their various fields of expertise. Classes are primarily held at 601 West Broadway (at Ash), Vancouver. Additional classes are held at Fader Master Sound Studio at 201 West 7th Ave., Vancouver, and Blue Light Studio at 650 Industrial Ave., Vancouver, near the main campus. Once a student successfully finishes the 15 required courses for certification, they receive Lifetime Alumni Status. This means that students may take any course within the part-time Digital Music Production Program at no additional cost, in perpetuity, in order to enhance and update their skills as technology changes. Registration for September 2019 starts in January. Part-time Ableton class starts January 4, 2019!